What would Friendsgiving be without amazing food? Start off what’s arguably the best holiday with incredible Friendsgiving appetizers. I’ve tried numerous recipes and had the pleasure of indulging in dishes my friends have brought over. It’s hard to narrow them down to a single list, but there’s only so much room on your cabinets and tables. I highly recommend divvying out the workload and asking one or two friends to help out with the apps. Besides, why would want to spend all day in the kitchen when you could spend the day with your friends? 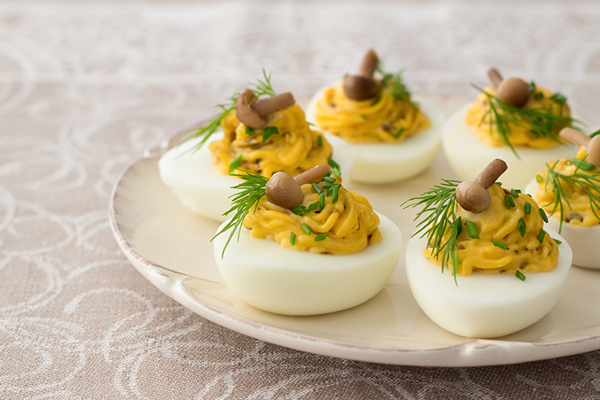 I’m a huge fan of deviled eggs. They’re great finger foods and you don’t have to stick with the same old recipe. My favorite version adds in Greek yogurt for an even creamier center. Plus, these are so easy to make. Boil your eggs and peel them when they’re done. They’re usually ready after a few minutes of boiling and another 10-12 minutes of sitting covered in the hot water. Cut in half and scoop out the yolk. Mix in all ingredients, except the salt, pepper and paprika, in a food processor or blender. Season with salt, pepper and paprika to taste and refill the egg halves. Top with a small marinated mushroom. One of my favorite Friendsgiving appetizers is a bit on the sweet side. Plus, it only takes four simple ingredients. It’s quick, so you’ll get to spend more time with friends. 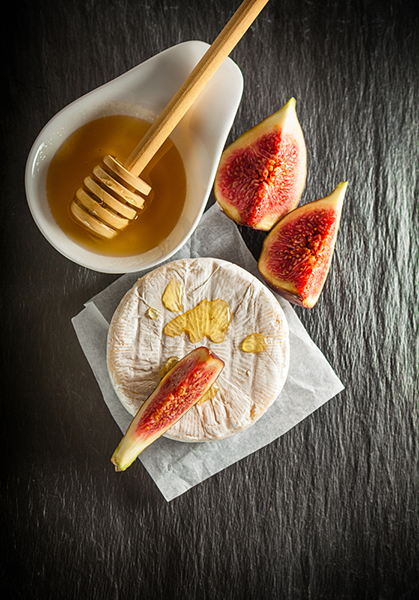 Place the brie on a serving platter and drizzle melted caramel over it. Check the packaging to see how long to heat the caramel. Sprinkle the almonds on top and spread crackers around the brie. Garnish with delish fresh figs. That’s all there is to it and your friends will love it. It’s a classic and that’s why it’s so good. My favorite part about this app is it makes nearly three dozen pieces. It’s ideal for larger gatherings or if you just want leftovers. Don’t be afraid to get creative and try different types of meat or cheese. It’s your Friendsgiving after all. Mix together the cream cheese, mayonnaise (or mustard) and seasoning mix. Place the cheese evenly on the tortillas and heat for about 8 seconds. Add 1/4 of your previous mixture to each tortilla and top with the ham and lettuce. Leave a little room at one end. Roll the tortilla towards the roomier end. Keep the roll slightly tight. Use toothpicks to hold the roll closed and refrigerate for an hour or two. Right before everyone arrives, cut each roll into 1/2 in. slices and spread out on a serving tray. I’m a huge fan of berries as an appetizer. They’re sweet and easy to turn into amazing treats everyone will love. While cranberries are used in the original recipe my friend gave me, I’ve used blueberries and strawberries before. Use whatever berry works best for you. 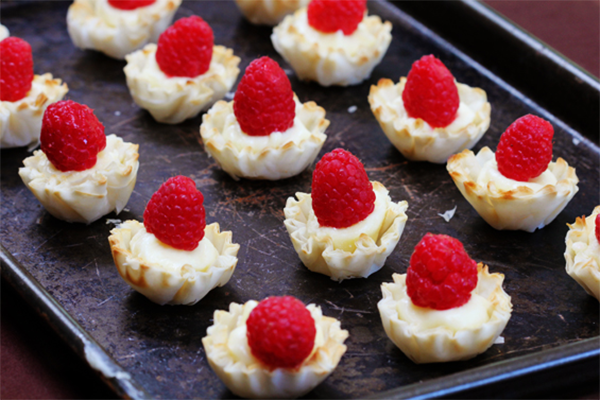 These cute little bites aren’t just great Friendsgiving appetizers, they’re also festive with the colorful berries. Start by rinsing your berries. You don’t want dirty berries on your cheese. Drain the berries and roll then around gently in a bowl of sugar. This helps sweeten them and adds a bit of sparkle. You can skip this step if your berries are already sweet enough for you. Now it’s on to the assembly part. Place a thin slice of brie, a layer of cranberry relish (you could also use all natural berry jam to match the berry of your choice) and several berries on each cracker. The berries should cover the relish or jam. Make sure you don’t add to many berries or your friends will be chasing berries across the floor all night. 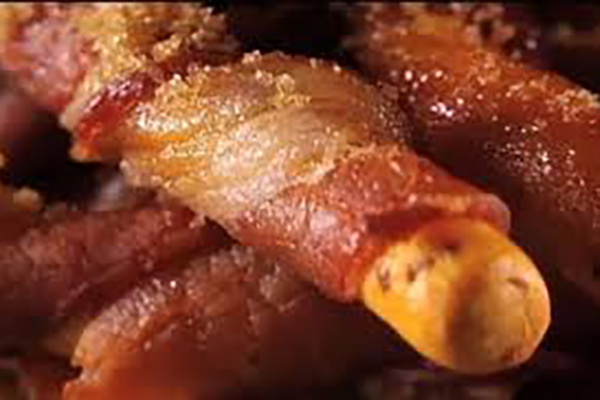 Nothing it better than bacon and nothing is lazier than wrapping packaged breadsticks in pig parts. Anyone with zero to moderate-level culinary ability could create these savory little masterpieces ahead of party time and shove them in the oven for 15 minutes. 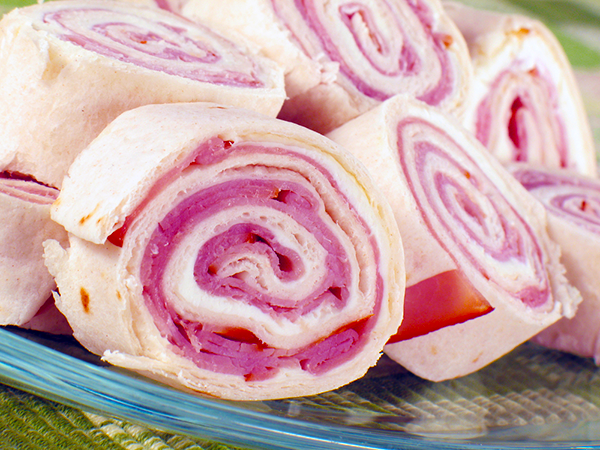 Wrap breadsticks in bacon and place on foil-lined baking sheet. No need to use cooking spray. The bacon fat will suffice. Oh, will it suffice. Bake at 360 degrees for 15 minutes or so, until the bacon is cooked. 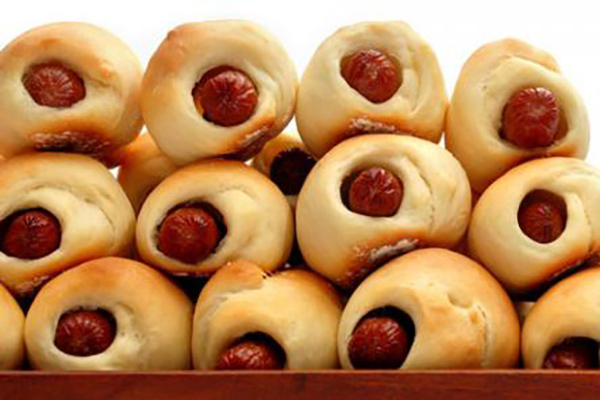 This is a little more involved, since you need to wrap many individual mini hot dogs in the Pillsbury Crescent Roll dough. Yes, you have to get Pillsbury Crescent Rolls or it doesn’t work. And get the original flavor. Forget this garlic noise or butter flavor. Wrap each dog with a little piece of the crescent roll dough. The general rule is 4-5 dogs per each triangle of dough. But add or subtract from that dough to dog ratio at your pleasure. Bake ‘em at 375 for 10-15 minutes. Keep an eye on them to make sure they don’t get too brown on the top and underside. Serve with catsup and mustard. These are just a handful of my favorite Friendsgiving appetizers. Add your own spin and create something new to really get everyone talking.